Dr. Richard Amato now welcomes new patients with sensitive teeth and receding gums in Danbury, CT, for the revolutionary Chao Pinhole® Surgical Technique, with or without a referral. Dr. Richard Amato Offers Minimally Invasive Treatment for Receding Gums in Danbury, CT. Patients with receding gums in Danbury, CT, are now welcome to receive the gentle and effective Chao Pinhole® Surgical Technique from Dr. Richard Amato, with or without a referral. Dr. Amato is an experienced periodontist who has practiced in Monroe, CT, since 1989. He recommends the Chao Pinhole® Surgical Technique for patients with sensitive teeth due to receding gums because it is minimally invasive and can quickly reduce gum recession without sutures or scalpel incisions. Dr. Amato always strives to offer his patients minimally invasive care, including the Chao Pinhole® Surgical Technique. This gentle procedure is ideal for patients who have sensitive teeth as a direct result of receding gums in Danbury, CT. Receding gums are common in adults, and are often caused by gum disease. However, gum recession can also be caused by certain medications, genetics or consistently brushing the teeth too vigorously. Regardless of its cause, gum recession can lead to increased oral discomfort, tooth sensitivity and eventual tooth loss. As the gum tissue recedes, it can also cause the teeth to appear elongated and disproportionate. Patients experiencing common symptoms of gum recession are encouraged to learn more about the treatment options available to them, including the minimally invasive Chao Pinhole® Surgical Technique. The Chao Pinhole® Surgical Technique treats gum recession with less discomfort and a faster recovery period than other treatment options. During the innovative procedure, no sutures or scalpels are required, since access to the gum tissue is gained through a tiny pinprick hole. Dr. Amato uses a needle to create the tiny hole in the gum tissue just above the receded site. Once the hole is made, he gently guides existing gum tissue over the exposed root structure. The procedure can be completed very quickly, and multiple sites can be addressed in the same office visit. Dr. Amato encourages patients with sensitive teeth from receding gums in Danbury, CT, to receive a treatment consultation. Appointments can be scheduled by calling Advanced Periodontics and Dental Implant Center of Connecticut at 203-712-0917. 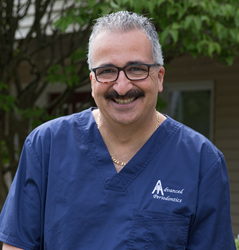 Dr. Richard Amato is a leading periodontist and dental implant specialist who provides personalized dental care using the most advanced technology for patients at Advanced Periodontics and Dental Implant Center of Connecticut LLC in Monroe, Connecticut. He has placed thousands of dental implants since 1989. Dr. Amato earned a DDS degree from Stony Brook University. He then completed a full-time multi-year specialty residency and received his Certificate of Proficiency in Periodontics from Eastman Dental Center at the University of Rochester. He belongs to the one percent of dentists in the USA currently providing the first FDA-cleared laser procedure for gum disease treatment. Dr. Amato is the first and most experienced provider of LANAP® therapy in Fairfield County, Connecticut as well as the first periodontist to provide the Pinhole® Surgical technique in CT. To learn more about Dr. Amato and his dental services, visit his website at http://www.connecticutperiodontist.com and call 203-712-0917.